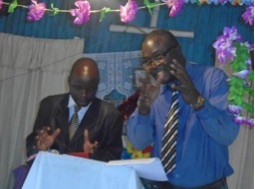 Here are some news segments from Pastor Sam Oluoch and Grace Baptist Church Kisumu, Kenya. In mid-April, we had to honour a ‘Macedonian call’ to help revive a Bible school in a place called ‘Kamagambo.’ Pastor Andrew Onserio, who has been attending our annual conference since 2013, has been convinced of the doctrines of grace. He wants this to be propagated in his churches and thinks he is not able to without our help. Andrew is a lovely man who gave us his pulpit, and we chose the theme ‘The Gospel the Apostles Preached.’ Pastor Naphtally and I gave it our best shot - I took three sessions and my brother took four. This was crowned by time for questions and answers. Andrew’s church genuinely showed a hunger for more of God’s word, to such an extent that we had to promise that this will become an annual conference just to bring the doctrines of grace to this side of Kenya. This brother has a good heart for the spread of the truth. We all agree that this needs to be supported. Pray for this work and the labors we did put in. Also in mid-April, church members came out to reach the neighborhood, door-to-door and those walking on the road, with the gospel and an invitation to church. Over 500 people were talked to! The following day, Sunday 17th, we witnessed the fruit of our labors with over 17 new faces joining in the service. I preached an evangelistic message from Matthew 11: 25-30, and afterward, we shared a snack lunch with every one present. Pray for these efforts to bear fruit in souls getting saved. Worth mentioning here is the blessings that God has shown us of late with quite a number of souls coming for the Sunday service and enjoying the ministry. The deacons had to buy an extra 30 chairs to manage the increasing number. Out of these, some come already born again while quite a number are not. We long to see them get saved. Joshua, Magomere, Linda, Amos, and Phelly are just a few who very soon will be admitted into the membership. On April 29th, elder Ken, Pastor Sam Odeny, and I traveled to Ndola, Zambia for a graduation ceremony. It was a solemn moment to see students of our Kenyan Reformed School of Theology (KReST) at last making it to the finishing line. Brethren in Ndola warmly received us and gave us fellowship. Back home, the church gathered at elder Ken’s home for a thanksgiving ceremony for the effort of the graduates. Encouraging speeches were given.